Did you know that you can convert an attribute table directly to an Excel spreadsheet in ArcGIS? If you are using ArcGIS 10.2 and above, you can use the ‘Table to Excel’ tool to export attribute table to Excel. It’s a simple tool with time-saving benefits. In the Conversion Toolbox, expand it so you can see the Excel toolset. Once again, expand the toolset and double-click the Table to Excel Tool. Simply, add your table that you want to convert to a spreadsheet. Finally, give the Excel file a name in the output. In addition, you can set to show field aliases in the output take. 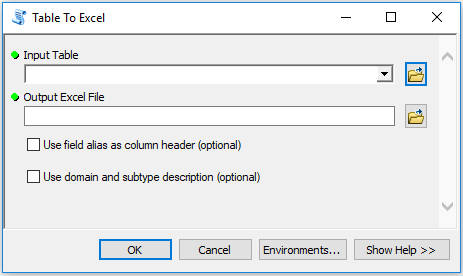 This determines how to display column headers in the spreadsheet. Lastly, you can change subtypes as values or its coded-value domain. The old way to do it was to copy and paste your selected records from ArcGIS directly into Excel. Also, you could open the attribute table and export as a CSV or TXT file. But exporting records with the attribute table doesn’t allow you to set the file type to XLS. Instead, you can use the ‘Table to Excel’ tool to convert your shapefile to an Excel spreadsheet. Now, this is much easier, especially if you have a lot of records. And if you want to do the reverse, you can import tables with lat, long coordinates and create XY points from Excel. We’ve listed some tips and tricks in ArcGIS, what other top-secret tools you use that makes your life easier?